When travelling around South America, you cannot go past a bakery or a ‘Panaderia’ (bakery in Spanish), without coming across these little bites of heaven. The name Alfajore actually comes from an Arabic term meaning ‘Stuffed’ which is exactly what these biscuits are. Alforjores are two shortbread biscuits or cookies, effectively held together with ‘Dulce de Leche’. Dulce de Leche is condensed milk, which combined with the shortbread biscuits creates what can only be described as a little miracle on the taste buds. The butteriness of the shortbread, mixed with the creaminess of the Dulce de Leche creates this delightful taste which keeps you going back for more and more. My husband and I are in fact back in Peru for a couple of months and have placed ourselves just outside the small village of Pisac. It is roughly a mile and a half walk to the nearest bakery. I would like to think that we strategically placed ourselves with enough distance from the town, to make it all the more harder to get our hands on one of these babies. I know I could make them myself, but homemade in a Peruvian bakery by ‘Mamasitas’ – there is just no contest. When I first discovered the taste of the South American Alfajore, I recreated it back in the UK and this is my recipe, so that you at home can enjoy this South American delicacy. In a large pan, add your milk, corn syrup, baking powder, salt and sugar. Place your pan of ingredients over a medium to high heat, mix your ingredients together slowly using a wooden spoon and bring to the boil. Once your milk begins to foam, stir again and turn down the heat until your milk is at a low constant boil. This is quite a long process, however continue to stir your milky mixture, ensuring that no milk gets stuck to the sides of the pan. After approximately 40 minutes to an hour, your milk mixture will become thick and will turn a caramel colour. It is extremely important at this stage to continuously stir the mixture as it can burn. If it burns, the taste becomes very bitter and not pleasant, so you will have to start the whole process again. Once the Dulce de Leche begins to reduce down to approximately 300ml, remove from the heat and strain. Once strained, add in your pure vanilla extract and stir until fully incorporated. Your Dulce de Leche is ready, set to the side to cool, whilst you make your shortbread biscuit. Dulce de Leche can be stored in the fridge for up to a month. Set your oven to 180 Degrees Celsius and line two flat baking trays with parchment paper. In a clean, dry bowl add in your butter and beat continuously until it turns from a yellow colour to a pale cream colour, this should take around 5 minutes. Once the colour change appears, add in your sugar and beat again until the mixture becomes light and fluffy. In a separate bowl, add your flour and salt and mix with a spoon. Now, add your flour mixture to your butter mixture 1/3 at a time and mix well. Once the 1/3 of flour has been well incorporated into the butter, add in your next 1/3 until you have finished your flour. Once these ingredients have been well mixed together, add in your pure vanilla extract and mix again. Your mixture should be quite sticky, flatten your dough into a disk shape, wrap in cling film and chill your dough until it becomes firm to the touch, this should take about an hour. After your dough is ready, remove it from the fridge and the bowl and place on a well-floured surface. Roll out your dough until it is roughly 0.5cm thick. Using a round cookie cutter approximately 5 cm in diameter, cut out rounds and place them on the baking sheet. Once you have a baking tray with your round pieces of dough evenly spaced out, place your baking trays in the fridge for 15 minutes. This will ensure that the cookie dough hardens and remains in shape throughout the baking process. Once the 15 minutes are over, place your baking trays in the oven and leave to bake for 7 to 10 minutes or until the cookies turn a light brown colour. Once this colour change occurs, remove them from the oven and leave to stand for 10 minutes on the baking trays. Then, remove them from the baking trays and leave to stand on a wire cooling rack until they have become completely cold. Now for the fun part, take two of your shortbread biscuits and place a heaped teaspoon of your Dulce de Leche on to the underside of each biscuit and then sandwich them together. 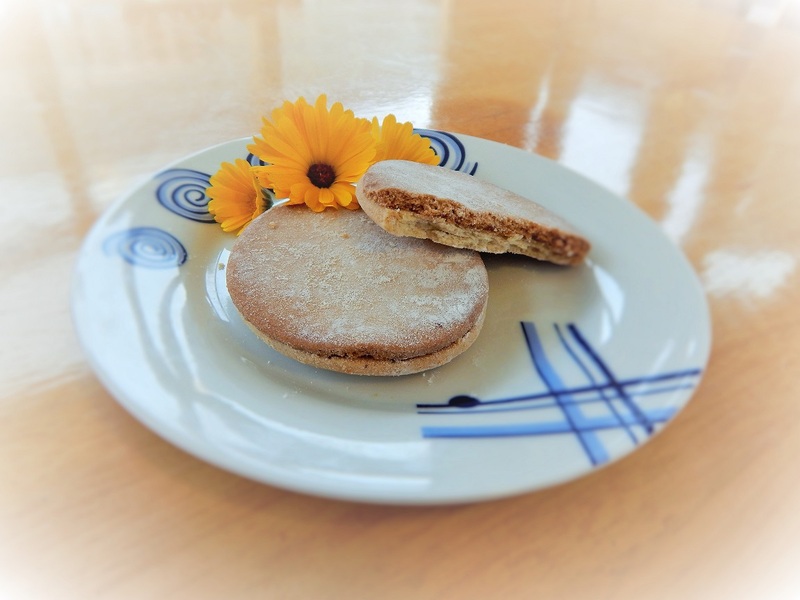 Sprinkle some icing sugar over the tops of your sandwiches and there you have it, the perfect recipe for homemade South American Alfajores. Hope you have enjoyed this recipe and don’t forget to share! Wow, that sounds just incredible 🙂 I love being able to recreate a local delicacy when I have moved away from the place, it feels like I’m taking a part of that place with me.